The globe’s unbroken hot streak is inching closer to 29 years, with new data showing that October was the 344th consecutive month with global average surface temperatures above the 20th century average. According to data from the National Oceanic and Atmospheric Administration released on Monday, the global average surface temperature for the month of October was 1.13°F above the 20th century average (1961-1990) for the month. That’s enough to make this the seventh-warmest October on record in what is also likely to be the seventh-warmest year on record, according to a recent report from the World Meteorological Organization. The last time the globe had a cooler-than-average month was February 1985, and the last cooler-than-average October occurred in 1976, shortly before Jimmy Carter beat Gerald Ford in that year's presidential election. Global temperature departures from average for October 2013, which was the seventh-warmest October on record. Australia is among the red areas on this month's temperature map. The country continued its streak of 15 straight months with above average temperatures. This October was 2.57°F above average, making it the nation's seventh-warmest October and keeping Australia on track to have its hottest year ever. Some areas within the country dealt with even more extreme heat. For example, temperatures were 6.48°F above the long-term average in Sydney, according to Australia's Climate Council. That helped fuel intense bushfires, with thick smoke darkening the skies above the city for days and leading to some of the poorest air quality on record there. Brisbane's average temperature in October was 83.84°F, its hottest on record for the month. Above average temperatures extended to the opposite end of the globe as well, where Alaska had its record-warmest October with temperatures running 8.8°F above average. It was a different story in the Lower 48 states, though. Warmth in the Northeast was balanced by cooler temperatures overall, and the U.S. was one of the few places around the globe with cooler than average temperatures for the month. That’s in part because every state west of the Mississippi (except for Texas) was on the cool side. Cold weather was responsible for the strong blizzard that walloped South Dakota in early October. The storm whipped winds up to 70 mph and dropped up 3 feet of snow across Wyoming and South Dakota, but some individual totals were much higher. Lead, S.D. picked up an astonishing 55 inches of snow over 3 days. More than 20,000 cattle were lost and economic losses are estimated to be $1.7 billion. The widespread cattle losses led to a rare Presidential Disaster Declaration for an October snowstorm. 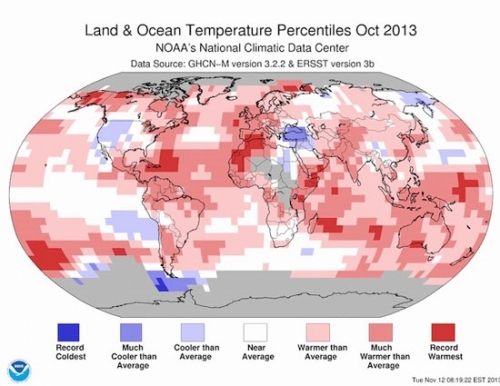 In Europe, Spain’s temperature ran hot enough to have its sixth-warmest October on record. On the southern side of the Mediteranean, a good portion of northwest Africa experienced its hottest October on record. Christopher Burt of Weather Underground reported that temperatures in Matam, Senegal hit 111.2°F on October 19th and 20th. Annual peak Antarctic sea extent since 1979. The peak is generally seen at the end of Antarctic winter. October also marks the end of winter in Antarctica. Over the course of that dark season, sea ice accumulates and stretches its icy grip around the continent, peaking in late September or early October. The region's sea ice reached its maximum extent on September 22 this year, setting an all-time record of 7.52 million square miles. 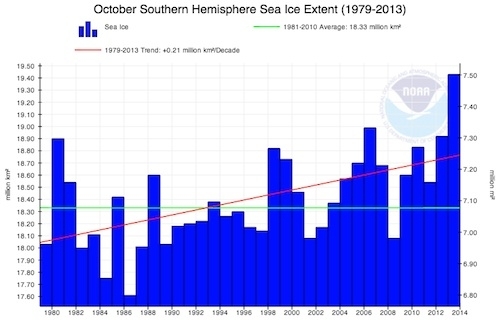 Though sea ice has since receded, it still covered 7.5 million square miles this October, setting a monthly record. That's over twice the area of the entire U.S. and beats the previous October record set in 2006 of 7.33 million square miles. This continues a trend of growing Antarctic sea ice, which has been expanding by about 1.1 percent per decade since 1979. Scientists do not view this Antarctic sea ice expansion as a sign that global warming is slowing, however. The Southern Hemisphere's sea ice is mostly new ice that forms in the winter and disappears in the summer, and Antarctic sea ice is growing at a much slower rate than its Arctic counterpart is disappearing. Recent research also suggests shifts in Antarctic winds patterns could be a bigger driver of changes, with some contribution from the loss of ozone in the upper atmosphere.